MAYA & MARTY was helped by a strong lead-in. NBC: AMERICA’S GOT TALENT remains a cornerstone of summer network TV, with a 2.5 season premiere that was just 0.1 off the pace of its 2015 debut. That gave MAYA & MARTY a solid lead-in for a 1.5 premiere, a very good number for a summer 10PM series, but the fact that the rating slipped from 1.8 in the first half-hour to 1.3 in the second indicates that viewer enthusiasm was soft. ABC: 500 QUESTIONS was up 0.2 from Friday’s airing at 0.9, and was followed by 0.7 reruns. 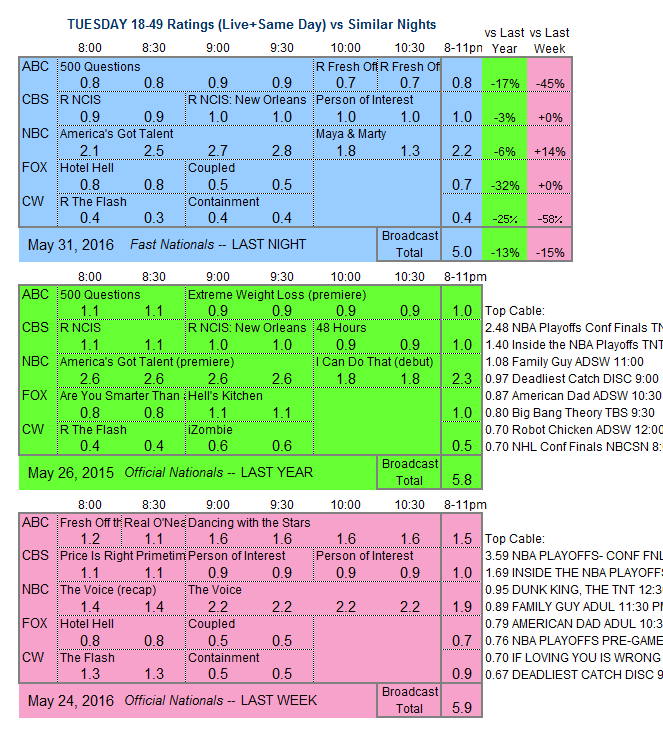 CBS: After 0.9/1.0 reruns, PERSON OF INTEREST rose 0.1 from last Tuesday to 1.0. FOX: HOTEL HELL and COUPLED held at last week’s 0.8/0.5. 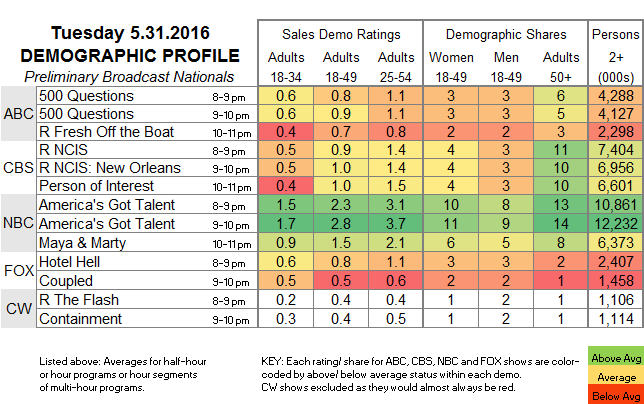 CW: CONTAINMENT, airing after a 0.4 rerun of THE FLASH, fell 0.1 to 0.4. AMERICAN NINJA WARRIOR, THE NIGHT SHIFT and MASTERCHEF return to the summer line-ups tonight, and 500 QUESTIONS finishes its limited run. Come back Thursday afternoon for detailed demographic ratings for top Tuesday cable programs, a day later than normal due to the Memorial Day holiday.